Still, with all these seeming leanings to ascetic conduct, these rabbis did not encourage individual fasting. The community in distress did indeed proclaim a public fast; and it was the duty of the loyal member to participate. For he who would not share in the distress would have no part in the consolation of the people (Ta'an. 11a). The habitual faster was called a sinner (ib.). This judgment was enforced by an appeal to the Biblical text in connection with the "Nazir's" (Nazarite's) expiatory sacrifice (Num. vi. 11). Rabbi Zeira would not permit his disciples to indulge in extraordinary practises of self-restraint, if they presumed thereby to reflect on the piety of others saner than they. The title applied to such an adept at saintly practises is characteristically deprecatory for his attitude of mind: his conduct is declared to smack of conceit, if not of hypocrisy (Yer. Ber. ii. 5d). Looking upon this life as essentially good, according to Gen. i. 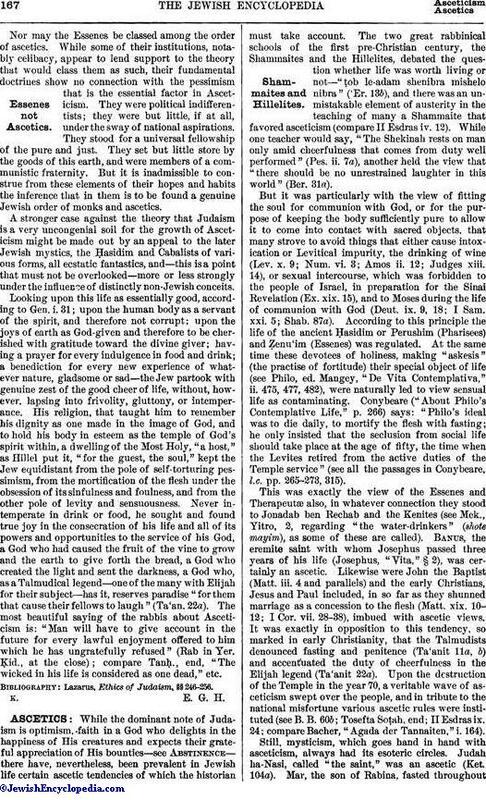 31; upon the human body as a servant of the spirit, and therefore not corrupt; upon the joys of earth as God-given and therefore to be cherished with gratitude toward the divine giver; having a prayer for every indulgence in food and drink; a benediction for every new experience of whatever nature, gladsome or sad—the Jew partook with genuine zest of the good cheer of life, without, however, lapsing into frivolity, gluttony, or intemperance. 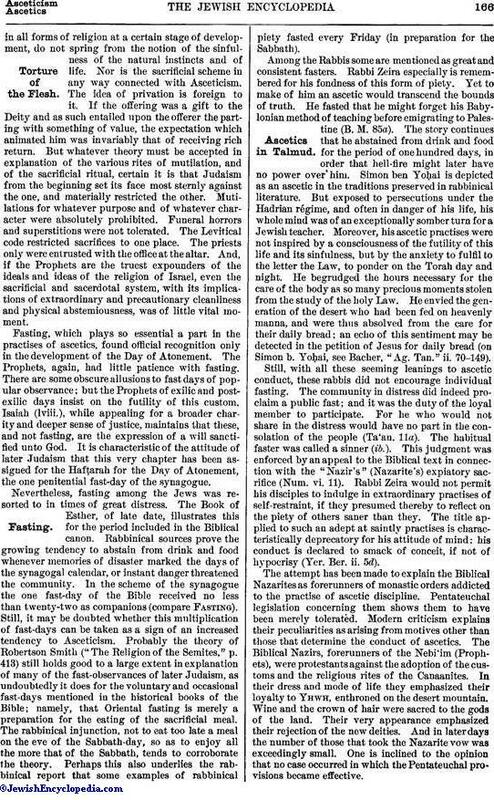 His religion, that taught him to remember his dignity as one made in the image of God, and to hold his body in esteem as the temple of God's spirit within, a dwelling of the Most Holy, "a host," as Hillel put it, "for the guest, the soul," kept the Jew equidistant from the pole of self-torturing pessimism, from the mortification of the flesh under the obsession of its sinfulness and foulness, and from the other pole of levity and sensuousness. Never intemperate in drink or food, he sought and found true joy in the consecration of his life and all of its powers and opportunities to the service of his God, a God who had caused the fruit of the vine to grow and the earth to give forth the bread, a God who created the light and sent the darkness, a God who, as a Talmudical legend—one of the many with Elijah for their subject—has it, reserves paradise "for them that cause their fellows to laugh" (Ta'an. 22a). The most beautiful saying of the rabbis about Asceticism is: "Man will have to give account in the future for every lawful enjoyment offered to him which he has ungratefully refused" (Rab in Yer. Ḳid., at the close); compare TanḦ., end, "The wicked in his life is considered as one dead," etc. 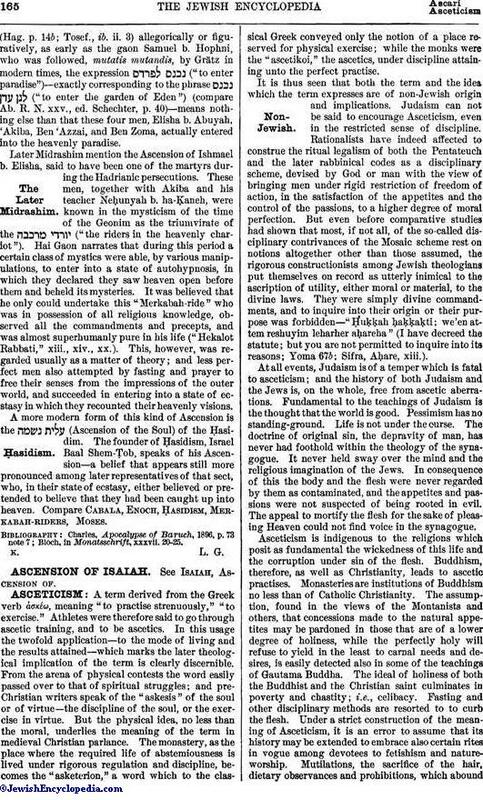 Lazarus, Ethics of Judaism, §§ 246-256.